LGC Global was selected as the Construction Manager at Risk for the replacement of 260,000 linear feet, approximately 49 miles, of a water transmission system spanning over 114 streets throughout the City of Detroit. The existing system was old and vulnerable to frequent water main breaks costing the City large maintenance and repair bills. 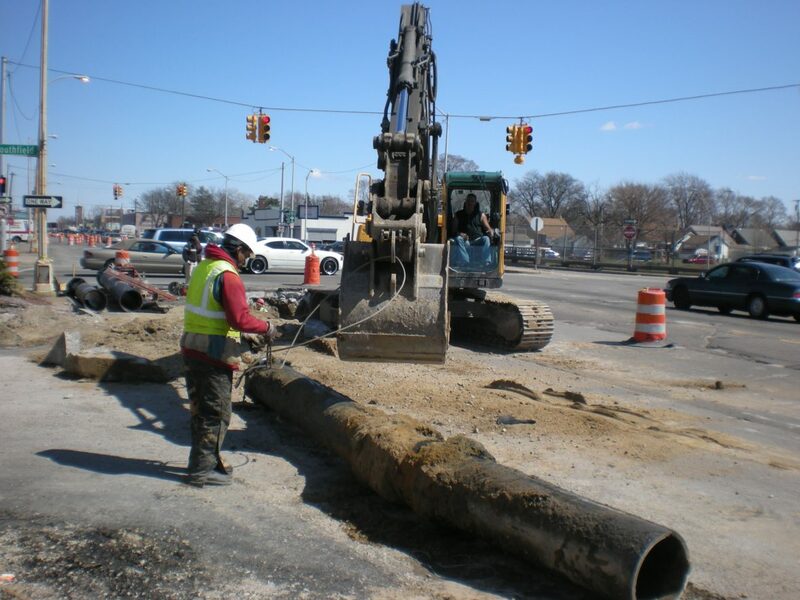 This project involved furnishing and installation of nearly 50,000 feet of 8-inch through 24-inch water main and related appurtenances, 8-inch through 16-inch gate valves, including restoration and associated construction management services in various streets throughout the City of Detroit. The execution of the project required extensive coordination with local utility authorities along with DWSD interdepartmental units, specifically at times of utility conflicts with the proposed new system route of installation. LGC gathered a team of ten supervisory and oversight workforce comprised of three engineers, six field inspectors and a construction manager. All team members were certified in underground utilities construction techniques and applications. The waterline replacement effort was limited within the City right-of-way under roadway pavements or under berms and sidewalks. Subsequent restoration of work areas accounted for a significant portion of the project work and all disturbed road pavements, sidewalks and berms were replaced in kind. As demanded by the system design, LGC was responsible for the removal and replacement of the existing water transmission force main network and associated gate wells and valves. All the necessary general management and construction tasks including, but not limited to coordination, field records and as-built drawings, quality control, quality assurance, field engineering, inspection and testing were maintained throughout the performance period of the project and 483 fire hydrants were also replaced and existing customers’ lead services were restored. LGC Global is a proven leader in developing comprehensive, cost-effective and adaptive solutions for projects and programs ranging in size from $500,000 to more than $3.3 billion. Drawing from our global presence, our construction management experts share the best of our international experience, innovative technology and repeatable solutions. We provide a unique, full-service approach through every phase of a project: design, engineering, and of course, the actual construction. It’s a completely transparent process, because in this business, nobody likes surprises. We consistently rank among the top contractors and construction management service providers in project excellence and construction safety, as demonstrated by the numerous awards we win every year from the most prestigious organizations in the world. On every project, we use cost-effective, sustainable construction methods and innovative thinking to meet our clients’ needs while preserving and protecting resources and causing less pollution and waste for future generations. Our impeccable reputation has been developed over a 25 year history of providing exceptional service to our clients. The cornerstone of this service can be traced to the team of knowledgeable and dedicated associates we’ve assembled. We strive to provide a “Best-in-Class” experience to our clients through an approach founded on the values of quality, integrity, service, and results.